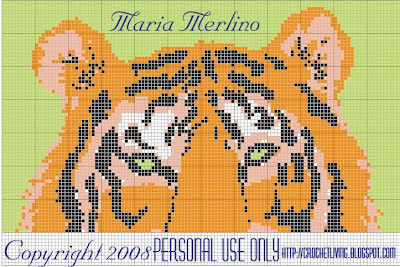 Crochet Living: Crochet Tiger Chart or Graph! Two Versions! 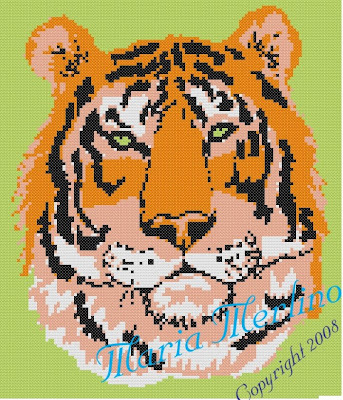 Crochet Tiger Chart or Graph! Two Versions! The Bengal tiger is a large, striped cat from India, Bangladesh, Nepal, Bhutan, and Burma. It lives in a variety of habitats, including rain forests and dense grasslands. The Bengal tiger can live to about 18 years in captivity, and probably a few years less in the wild. Bengal tigers are mostly solitary, but sometimes travel in groups of 3 or 4. These tigers are in danger of extinction due to over-hunting by poachers. Male Bengal tigers are up to 10 ft long; females are up to 9 ft long. The tail is about 3 feet long. The fur is usually orange-brown with black stripes. The fur on the belly is white with black stripes. White Bengal tigers (with white fur and black stripes) are very rare in the wild. You usually see them in Las Vegas acts. Tigers have long, sharp teeth in powerful jaws. 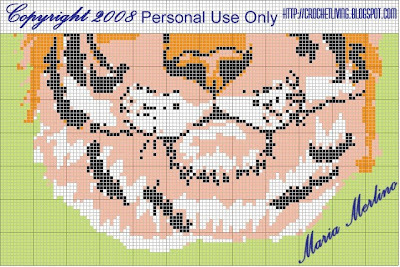 I had two requests from my friends over at Crochetville for a graph of a tiger. I designed one to be very realistic and the other as more of a line drawing for an easier chart. I divided the realistic tiger graph into two sections for ease in use and printing. 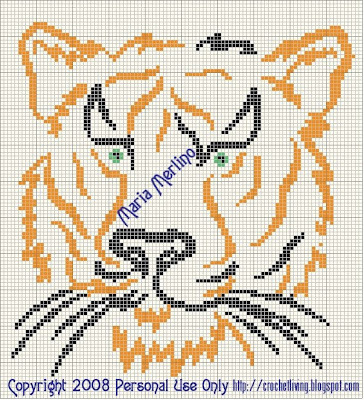 The chart is 140 squares high x 120 squares wide. If you are using sc to make this, chain 121, sc in 2nd ch from the hook and in each remaining chain. You will have 120 sc in the first row. This chart is recommended for advanced color workers or if you want to challenge yourself. There are only 4 colors involved. The next chart is 110 squares high by 100 squares wide. In sc, chain 101, sc in the 2nd chain from the hook and in each remaining chain. You will have 100 sc in the row. 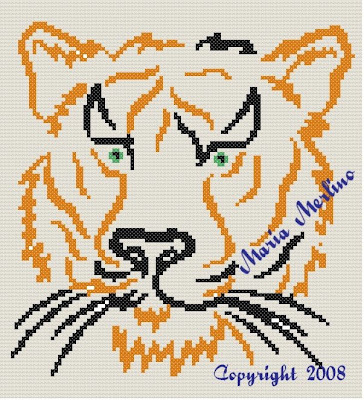 These charts can also be found on the Original Patterns Links on Crochetville.